They went out of business, because they were too good. 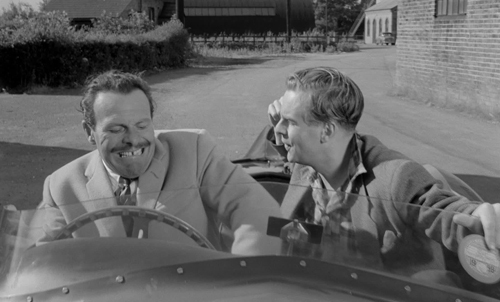 (SPOILERS) Possibly the pinnacle of Terry-Thomas’ bounder persona, and certainly the one where it’s put to best caddish use, as he gives eternally feckless mug Ian Carmichael a thorough lesson in one-upmanship, only for the latter to turn the tables when he finds himself a tutor. 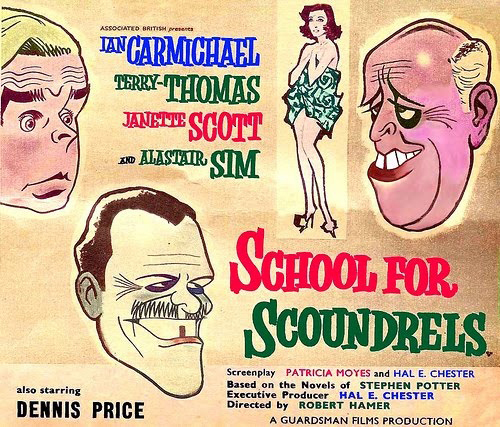 School for Scoundrels is beautifully written (by an uncredited Peter Ustinov and Frank Tarloff), filled with clever set pieces, a fine supporting cast and a really very pretty object of the competing chaps’ affection (Janette Scott), but it’s Terry-Thomas who is the glue that binds this together. And, while I couldn’t say for sure, this might have the highest “Hard cheese” count of any of his films. Based on Stephen Potter’s 1947’s humorous self-help bestseller (and subsequent series of -manship books) The Theory and Practice of Gamesmanship (or The Art of Winning Games without Actually Cheating), which suggested ungentlemanly methods for besting an opponent in any given field, game or sport through gaining the psychological advantage – tactics such as breaking one’s opponent’s flow, causing them to overthink or making intentional mistakes that would throw them off – School for Scoundrels became a decent-sized hit (the 12th most popular picture of 1960 at the UK box office), even though it was very much at the tail-end of the era of classic British comedy films (a later BBC One-Upmanship series starring Richard Briers was also made). 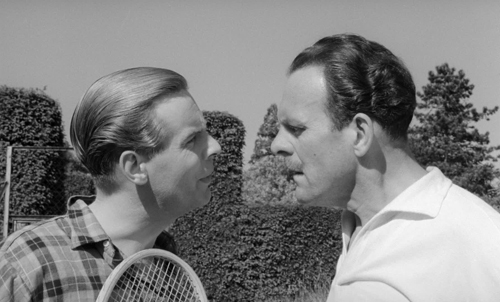 Carmichael’s patented upper-class twit had met with great success over the previous five years, most notably as Stanley Windrush in the Boultings’ Private’s Progress and its union satire sequel I’m Alright Jack, both also featuring Terry-Thomas (the former giving the world his simply marvellous insult “You’re an absolute shower!”). He’d also appeared with Thomas in the Boultings Brothers in Law, Happy is the Bride and played Kingsley Amis’ titular Lucky Jim. 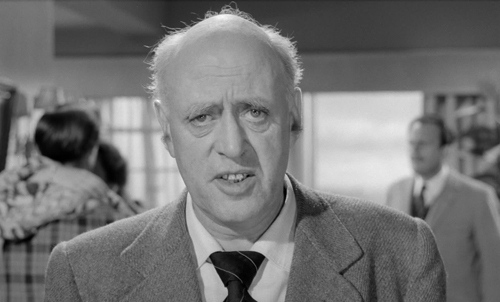 It’s fair to say the public knew the type of character he was essaying by this point, as did they Thomas, ditto Alastair Sim (both actors had worked with Sim on one or more occasions), so a role where Carmichael was the posh, but unremarkable Henry Palfrey seemed par for the course, and one where T-T, being a rotter, got one over on him, even more so. Peter Bradshaw, in a documentary on the Blu-ray release, has suggested School for Scoundrels is all about class, and middleclass Palfrey’s attempts to rise in status, but I’m not sure this isn’t a partial misreading. Certainly, Potter (fictionally portrayed here by Sim as dean of the School of Lifemanship) as an Oxford graduate and a member of the Savile Club, was familiar with rank and privilege, with those in the position to get ahead merely through being born ahead, but we aren’t really witnessing Palfrey’s struggle for status here. He already has that. He’s already the member of a club. He already has his own business, bequeathed by his uncle, in which he does very little. So much so that his daily grind amounts to attempting the Times Crossword and signing letters (he’s not quite in a position where he doesn’t have to work, like Bertie Wooster, but close enough) and is ordered about by his chief clerk, the wonderfully named Gloatbridge (Mr Grimsdale himself, Edward Chapman). Palfrey’s problem is a more universal one; he’s already mingling with the better-thans, just not getting any respect from them. Potter informs his class, of Adam biting into the apple in the Garden of Eden, “at which moment, the first loser was born” and is at pains to point out this isn’t a gender thing; male and female distinctions are superficial, as the world is simply divided into winners and losers. One might, applying the same criteria, also say it isn’t a class thing, although it will definitely give you a head start. “He who is not one up, is one down.” As Palfrey admits “Well, frankly, Mr Potter, I’m a failure”. 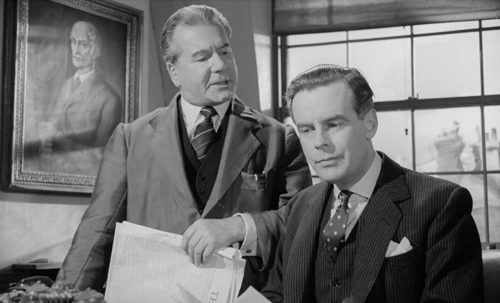 He has no backbone, and he is manipulated accordingly by all and sundry (John Le Mesurier’s head waiter, his junior office staff, the used car salesmen), indicative of how his lot is all about his personality. As such, the struggle depicted here is of the beta against the alpha male, and the evergreen fantasy that one can somehow be taught to become an alpha male. 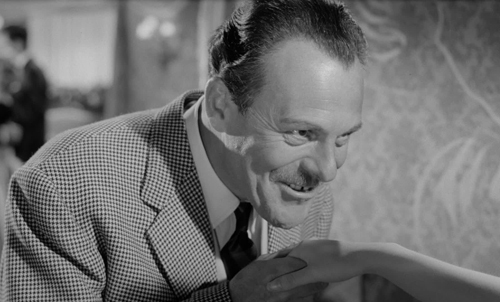 Carmichael made a career out of playing the slightly wet, manipulated beta male, whereas Terry-Thomas, although always destined to ultimate failure, made a career out of the dominating alpha. While there’s far too much here relating to such roles to fall back simply on a class reading, it’s notable that Thomas, characterised in ostensibly the upper bracket, is the middle-class actor who learnt to perform privilege (even to the extent of mentoring Carmichael in matters of culture and presentation), whereas Carmichael was forever destined to inhabit the posh persona par excellence (hence his taking lead TV roles as both Bertie Wooster and Lord Peter Wimsey when his big screen career tapered off). School for Scoundrels’ little man’s fantasy can be seen in a range of different comic features, from The Secret Life of Walter Mitty to The Nutty Professor (I’m thinking the original in both cases, although I’ll give you the Eddie Murphy remake of the latter, and Ben Stiller is generally prone to playing the beta guy). Palfrey is too well-meaning, too decent, and his encounter with the utterly reprehensible Raymond Delauney (the kind of name you suspect he made up for himself) leads him to toughen up. 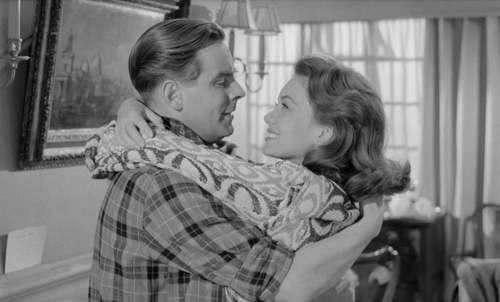 The notion that he could learn to be other than physically, socially and romantically inept is the cathartic one of the worm turning, with the caveat that he only turns so far, failing at the last hurdle of casting off his essential decency in the area of woomanship (while Scott’s April Smith finds Palfrey’s genuineness appealing, she doesn’t want someone who’s spineless). Carmichael’s characters are never quite as mawkishly indulgent as Norman Wisdom’s but they’re cut from the same naïve underdog cloth, only on a different side of the class divide. His pictures require a presence as unrepentantly unsentimental as Thomas to redress the balance, and as much as Palfrey’s succession of losses are excruciating, the pleasure of the (first half of the) picture is as much about Delauney getting away with being a blighter and stinker and loving every minute of it. The structure is a clever one, a flashback for the first forty minutes as Palfrey recounts his succession of shames to Potter, only for him get payback for – almost – each snub subsequently. Delauney first appears when Palfrey takes April to a restaurant and they’re unable to get in until T-T vouches for them. The latter instantly hogs April for himself, showering her with compliments (“Where did you find this lovely creature?”: “The Earth shook tonight”), impressive-sounding nonsense (“I always feel that food should be chosen to suit the wine, rather than the other way”) and showing off a flash car (his “Bellini” is a disguised Aston Martin) with a very T-T vulgar wolf-whistle horn. The subsequent tennis match is a succession of “hard cheeses” and maligning of Palfrey’s just-purchased, clapped-out 1924 4-litre “Swiftmobile” (a disguised Bentley), such that an embarrassed Palfrey pretends it isn’t his (Delauney’s “What on Earth’s that? 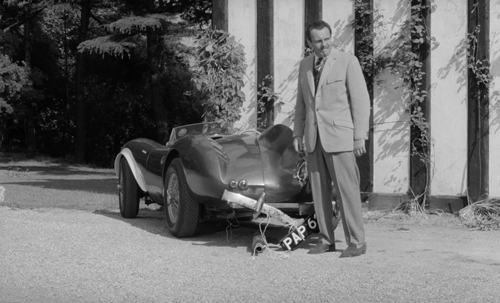 Looks like a Polish stomach pump” is hilarious, but most wounding to Palfrey is April’s fair call of “What idiot would buy a car like that?”). 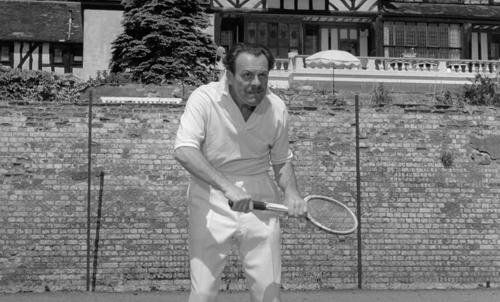 Palfrey’s subsequent besting of Delauney, off-balancing and ruffling that smooth self-confidence and entirely disrupting his flow during their return tennis match is a tour de force of Terry-Thomas enragement (“Do you think I ought to tell her it was my fault we are late?” asks Palfrey, having purposefully made them late for the club; “No!” screams Delauney. “Oh nuts!” explodes Delauney, as the game becomes a debacle. “And we don’t tolerate filthy language in this club, sir!” warns a club member) I’m not entirely convinced of Delauney’s credits-roll need to enrol at Potter’s school, however, since he knows this stuff himself instinctively; presumably, he just wants to be unstoppable. Admittedly, there isn’t much of a role for the love interest in all this, with the men simply duking it out over April’s affections. 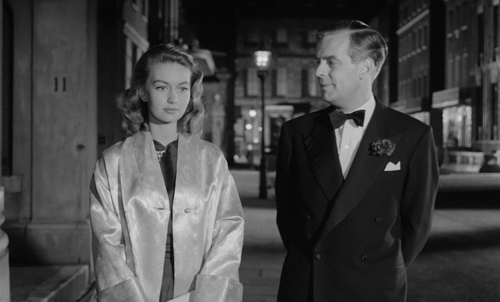 Scott’s adorable, particularly in Palfrey’s dressing gown, but the shorthand of her not being at very least annoyed with Henry’s manipulative behaviour because he didn’t go through with his flawlessly planned seduction technique serves to emphasise how reactive and functional she is (the preceding scene, as Palfrey engineers spilling wine on April’s dress as a prelude to having his way with her is the picture at its most ruthless; this is earlier played for laughs, with Hatti Jacques on hand for sofa technique at the school – there’s even an assisting reclining chair: “It smacks a little of impatience, yes” agrees Potter). You might charitably argue that April has intuitive insight into the truth of the matter, but this doesn’t really allay the sense that she’s no more than a prize to be earned; broad stereotyping such as Palfrey’s holey socks instantly bringing out her maternal instincts needed to be balanced by the kind of memorable characterisation almost everyone else in the cast is given. Indeed, the one-sidedness is additionally underlined when you realise that Carmichael, although generally playing someone a good 10 years younger than himself, wasn’t far off twice Scott’s age. Hence, “Then you can tell your Uncle Henry all about it”, at the height of Palfrey’s attempt to compromise her, being a little too close for comfort. 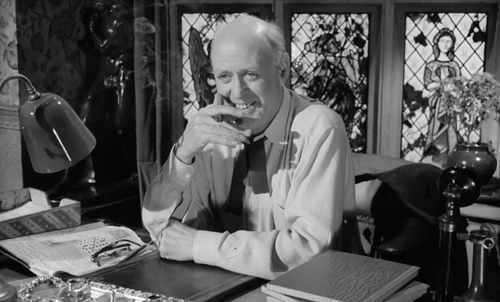 Palfrey’s other reciprocations are entirely differentiated however; he’s giving as good as he got, from shrewdly putting Gloatbridge in his place with some interpolated accounting, suggesting the 32 years he’s been with the firm is “Perhaps almost…” – he doesn’t need to actually say “too long” – and entrapping him into smoking his first cigarette in 10½ years. Dudley Dorchester: They went out of business, because they were too good. Most satisfying, though, is his rematch with The Winsome Welshmen, played by Dennis Price (Dunstan Dorchester) and Peter Jones (the voice of the book in The Hitch Hiker’s Guide to the Galaxy, amongst many achievements, as Dudley Dorchester); their characters were very similar to those played by Ustinov and Jones in ‘50s radio show In All Directions, and Ustinov was set to reprise his role here, but for shooting on Spartacus. Their business patter is entirely designed for here-coming-another-sucker (“With this sort of car, age is really of no cost”) and a desire for easily clearable cash in event of dissatisfied customers (“Cheque to bearer, if you don’t mind. 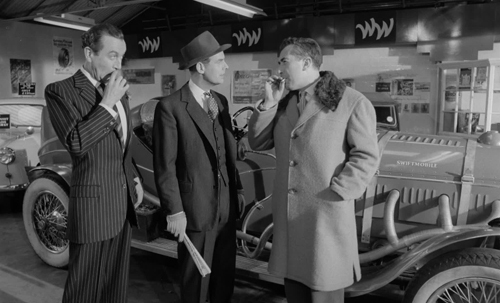 And please don’t cross it, sir”), so Palfrey manoeuvring them into paying him 100 guineas for the car and a swap with new sports car, amid knowledgeable gibberish about the changing the Swiftmobile’s multi-hydronuts and feeding it a mixture to get the best out of it (“One of petrol, two of meths”), and having a racing driver interested, is most amusing. Price had, of course, previously appeared in director Robert Hamer’s peerless classic Kind Hearts and Coronets, and School for Scoundrels sadly represented the final curtain for the director, who had descended from a functioning alcoholic to a non-functioning one. 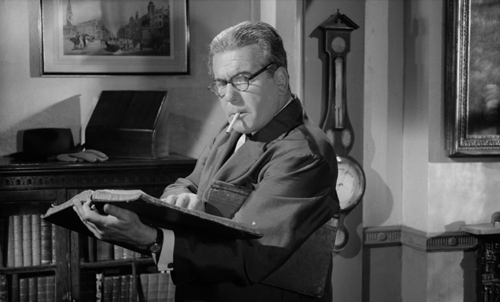 He was fired and Cyril Frankel (who went on to direct many ITC series) completed the picture. 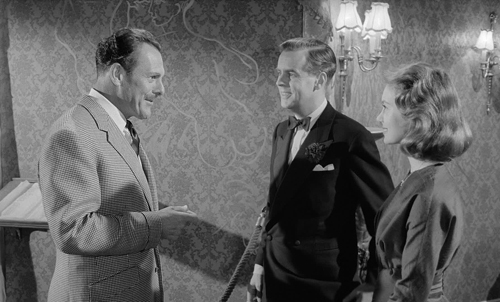 You wouldn’t know there were any such ructions, so easily confident is the finished film and so smoothly does its effective repertory company fit in. Potter: I do apologise, ladies and gentlemen – Stop that music! Orchestra, orchestra. Stop that infernal din! Potter’s reaction to Palfrey turning away from his teachings is understandable horror, undermining the very essence of his unethical business, so much so that he breaks the fourth wall. That’s probably the picture’s sole nod to the more irreverent techniques that would increasingly become the norm in the decade to come (the Boultings were working regularly with Peter Sellers, of course, and The Goons had been practicing that sort of thing on the radio, but it would still take a while for that kind of anarchy to seep into the actor’s big screen work). As the decade found its footing, the gentler type of picture School for Scoundrels represents quickly became obsolete. 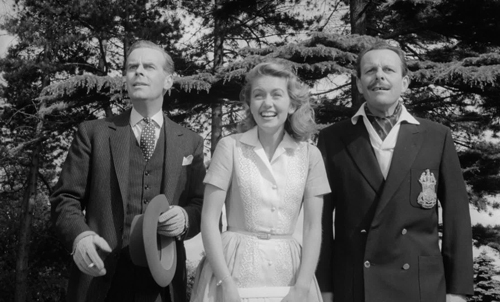 Terry-Thomas took a crack at the US while Ian Carmichael found a more receptive home on TV. 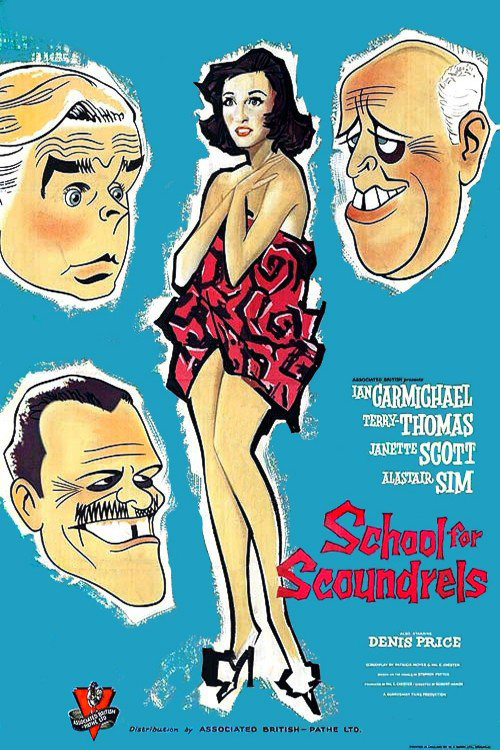 Which doesn’t make it quite a changing of the guard, but School for Scoundrels nevertheless represents one of the last of its kind, as well as a very funny, wholly-satisfying satire of social mores. Also of note, the late, great, sadly cut off in its prime Neon magazine published a seminal list of 100 Films You Must See Before You Die back in 1997. 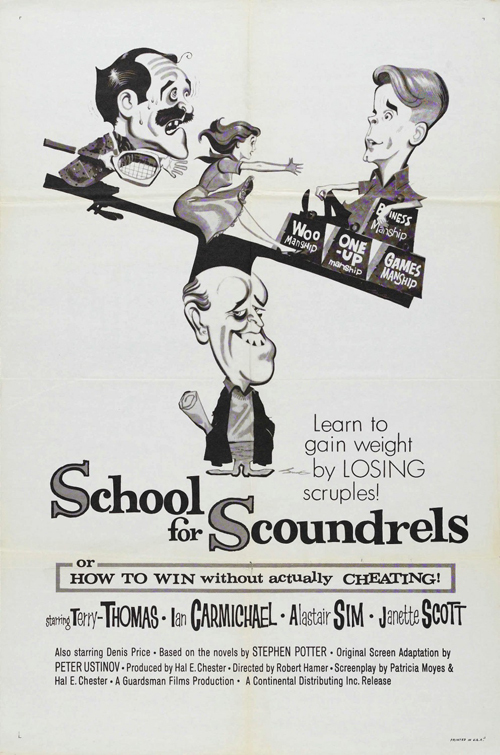 School for Scoundrels was featured at 48: “a remarkably nasty little film”. Which you might argue, but no more than Kind Hearts and Coronets or The Naked Truth are. If Palfrey hadn’t made the thoroughly decent choice at the end, Neon’s verdict might have held more water. As Potter notes, despairingly, “Once sincerity rears its ugly head, lifemanship is powerless”.